Consider this my annual plug for Loudmouth Collective, one of my favorite new theater companies, if you can still call them "new" after four seasons of smart, intense, funny, beautifully executed theater. They only do two shows a year (often including one at the Fringe), and typically only run for two weekends, so you need to be quick to catch them. And trust me, you will be rewarded. I've been with them since the beginning and they never disappoint. Firstly, their choice of plays is interesting and excellent, small-cast (often one or two actors), smartly written, bitingly funny or darkly absurd or heart-breakingly beautiful or some combination thereof. Secondly, the production always brings out the best in the play thanks to the great artists involved. Daniel MacIvor's two-person drama about brothers coming together after the death of their mother seems tailor made for Loudmouth. It would behoove you to get your tickets now to see this funny, bittersweet, and well-acted gem before it's gone! Hamilton and Kyle are two very different brothers. Hamilton designs buildings, Kyle sells them. Hamilton is in a (seemingly) stable marriage and home, Kyle moves frequently and his current boyfriend is a "professional." The death of their mother in a freak accident brings them together, whether they like it or not. They have to deal with the obituary, the wake, the eulogy, the will, and mother's crazy but beloved dog Enzo. Both brothers very realistically and differently negotiate the waters of grief in ways that will make you laugh, cringe, and empathize. We also get to hear from mother herself about her privileged but lonely life, and the relationship that ultimately taught her to love. 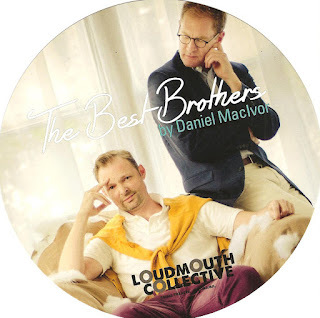 David Mann (Hamilton) and Wade A. Vaughn (Kyle) are two of our finest actors (see also The Consolation, one of last year's best Fringe shows, and Loudmouth's Cul-de-Sac, also written by David MacIvers). The two of them together, playing brothers, are a dream team. Both make their individual characters natural and specific, have great chemistry as brothers, and bring their own unique spin to the characterization of the mother, as she approaches the audience and speaks directly to us. There's nothing fancy about this production, but everything about it is well executed in its simplicity. Open Eye's tiny stage behind the arch is hung with neutral drapes, with only two chairs and a coffee table to hint at location, creating a look of simple sophistication. Courtney Schmitz's lighting design nicely delineates scenes and A. Emily Heaney's costume design shows both brothers to be well dressed and well off, but allows their unique personalities to show through. Producing Artistic Director Natalie Novacek directs all of Loudmouth's works, and once again creates just the right tone of humor and pathos, as she makes good use of the small and intimate space. The Twin Cities are blessed with a plethora of theater companies, but the flip side of this bounty is that it can be difficult to keep up with or even be aware of them all. 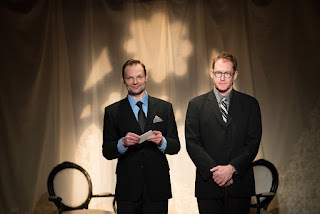 Loudmouth Collective is definitely one that should be on your radar as a Twin Cities theater-goer, with their specific point of view and quality productions. If you're familiar with Loudmouth's work you know what I'm talking about. If you're not, now's your chance! 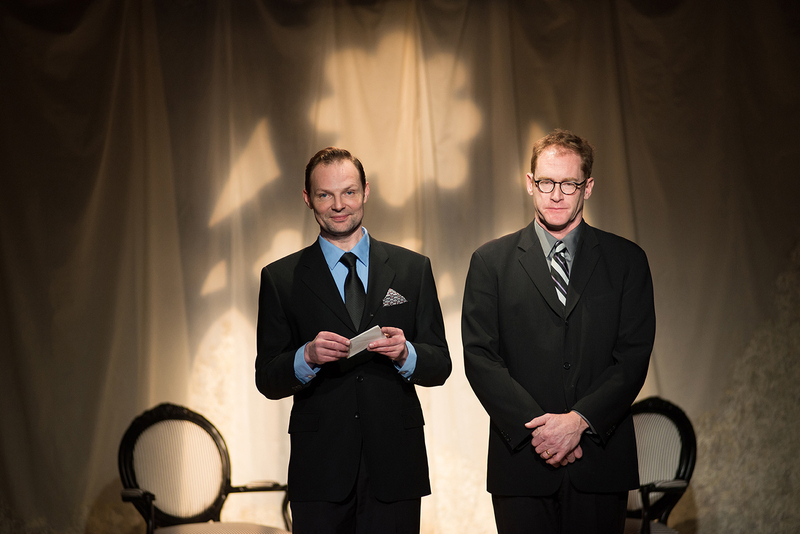 But quickly, before The Best Brothers closes on through January 24.